Thanks for popping in. 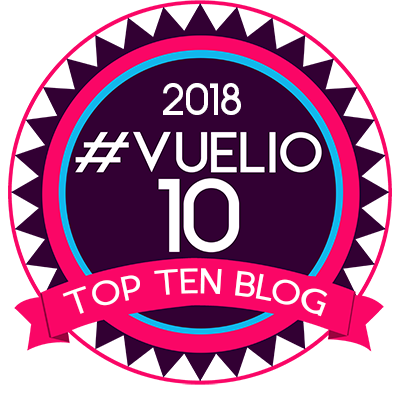 I have had a play this evening, and I thought perhaps you might enjoy a little challenge…. If I were to tell you that both of these cards were made together, from the same cut, could you figure it out? Could you work out how I made a dark glittery one and a glossy white one from the same process? It’s really easy when you know how! A £50 Claritystamp Gift Voucher! Got to be in it to win it!!! You’ve got till Midnight Saturday. On Sunday I will post the photo step by step – and announce the happy winner. If more than one person gets it absolutely correct, then we will draw a name out of a hat. As for the Bloggy Offer, I have just asked our Tom to drop the price on this beautiful die from £14.99 to £10 for 48 hours. Tis done. CLICK HERE It is just so perfect, and at that price, it is a gottahavit! Love the challenge. I’ve got no idea but I know that there will be plenty out there that will work it out. Good Luck every one. The die was cut using white card. The white waste is used on the coloured card. The die cut has been coloured using black ink and glued onto the yellow and green background. Drat. Ordered mine earlier this week and it’s already on its way lol. Looking forward to playing with it. I think you have brayered onto designer paper a rough square shape of versa mark. 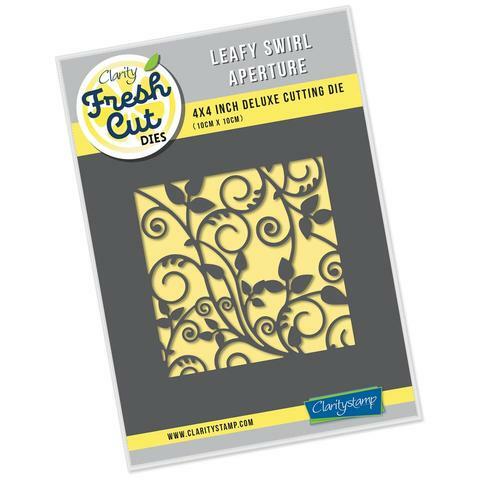 You’ve then die cut the leafy swirl with a square boarder die out of plain paper. Then taken the leafy swirl die cut square and turned it up side down on top of the versa mark and run it through the Gemini. Taken the die cut off the page so that both now have versa mark on them. Lastly you’ve then black embossed the die cut and white embossed the original page that was brayered. Cut the die and a frame in black card. Place on top of designer paper and cover everything with versa mark ink. 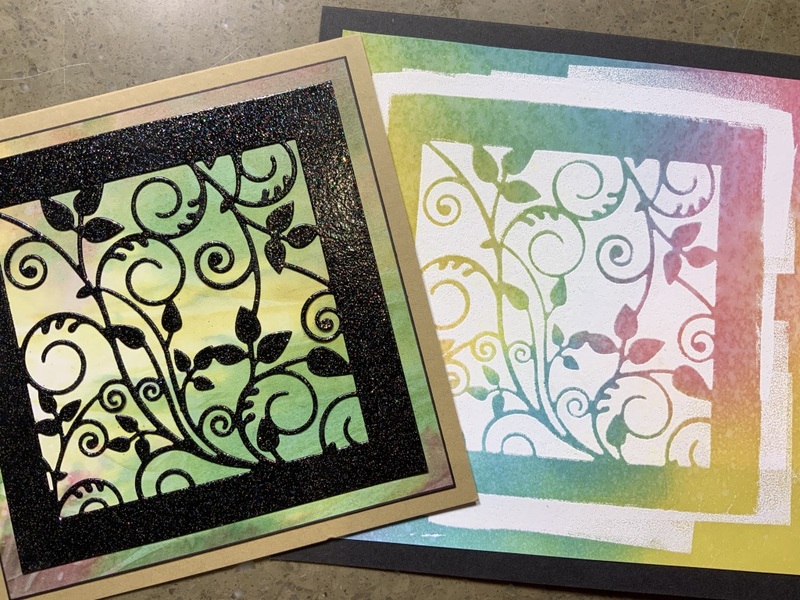 Add sparkly embossing powder to the black and white embossing powder to the designer paper. Think I know how this was done. Will try out my idea first to see if it works. If it does I may just take up this challenge just for fun. Hope the pottery went well yesterday. Been up since before dawn so it’s an early night for me. I bought the die last week at the NEC & was playing with it yesterday making 2 for 1 cards using double sided sticky paper. So tomorrow I will go through my stash & see if I can work out what you have done. I love a challenge so we will see what the outcome is. Good luck everyone. Hope your pottery was ok yesterday. 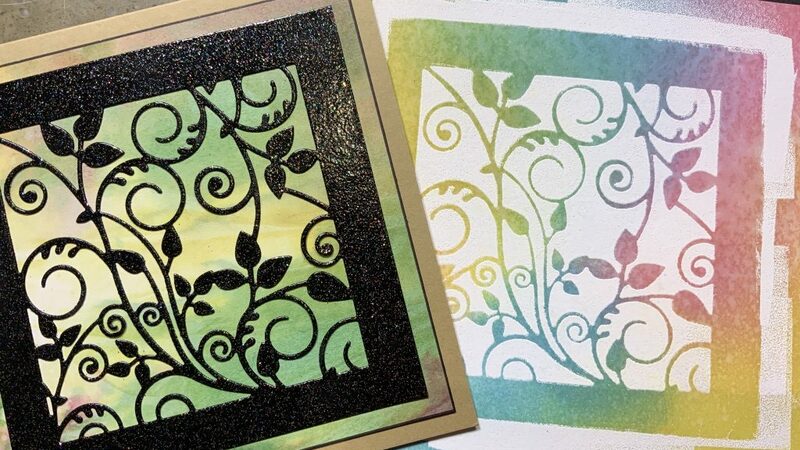 Lovely samples – I’ve been really enjoying playing with my fresh cut dies and having two cards from each cut! I’ll think about how you’ve created these and email through. The leaf die was cut from double sided sticky sheet. Then the main die cut was stuck onto a paper from your beautiful Shenandoaha?paper pad. Sticky paper removed and covered in performance black glitter embossing powder . Heated. Then glued onto one of your craft cards. Waist from main die cut stuck onto paper from northern lights?paper pad then top sticky sheet removed and covered in white inbossing powder. Heated. Stuck onto one of your black cards. Love the two cards, they are just so different, but as my brain cell is running at 50% battery power at the moment I might not be able to work it out, but will look forward to seeing the how to at the weekend. Might just slip the die into my basket though, well it would be rude not to wouldn’t it when you’ve gone to all that trouble to change the website!